polytec is giving cabinetmakers who are members of ICM Geelong the chance to WIN a prestigious award! The winning cabinetmakers will be announced on 23rd November, 2018. In the meantime, we will be showing off the quality work our cabinetmakers do using polytec’s finest quality decorative surfaces including cabinet doors, panels, benchtops and laminates. Entry 1 – SCLK. Small Range Joinery. Entry 1 – SCLK. Colour – Tessuto Milan. Entry 2 – Torquay Joinery. Kitchen. Entry 2 – Torquay Joinery. Product VENETTE. Entry 2 – Torquay Joinery. Colour Ultra White & Black cabinets. Entry 3 – SCLK. Small range joinery. Entry 3 – SCLK Colour Tempest. Entry 4 – KDS. Kitchen. Entry 4 – KDS. Colour Notaio Walnut. Entry 5 – SCLK. Small range joinery. Marina Grey Matt. Entry 6 – Torquay Joinery. Small range joinery. VENETTE Black & White. Entry 7 – Virgona Home Improvements. Small range joinery. Entry 7 – Virgona Home Improvements. ‘Man Cave’. Entry 8 – Torquay Joinery. Kitchen. Entry 8 – Torquay Joinery. Product VENETTE. Entry 8 – Torquay Joinery. Colour Ultra White cabinetry. Entry 9 – T & M Cabinetry. Small range joinery. Entry 9 – T & M Cabinetry. Natural oak ravine. Entry 10 – T & M Cabinetry. Kitchen. 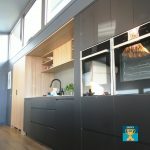 ntry 10 – T & M Cabinetry. Natural oak ravine. Entry 11 – T & M Cabinetry. Small range joinery. Entry 11 – T & M Cabinetry. Ultra White Gloss. Entry 11 – T & M Cabinetry. ‘ Bench seat’. Entry 12 – Torquay Joinery. Kitchen. Entry 12 – Torquay Joinery. VENETTE. Entry 12 – Torquay Joinery. Entry 13 – T & M Cabinetry. Kitchen. Entry 13 – T & M Cabinetry. Black Wenge Ravine. Entry 14 – SCLK. Kitchen. Soft walnut ravine. Entry 15 – JPH Joinery Alfresco area. polytec Laminate. Entry 16 – JPH Joinery. WOODMATT.